Have you ever noticed how swanky ancient soldiers looked? Whenever they're depicted on old pots, in the ruins of ancient mosaics, and carved into stones flanking historic cities, they are bedecked with fancy tall feathered helmets. Their fancy demeanor doesn't stop with their headgear. Their look extends to their carved leather armor, the shining metal gauntlets on their arms, and finely decorated shin guards. With all this finery, there's no way Greek and Roman soldiers would have let their footwear fall to the wayside. What's the point of polishing your bronze chest piece if you're planning on slipping on sneakers before mounting your chariot? 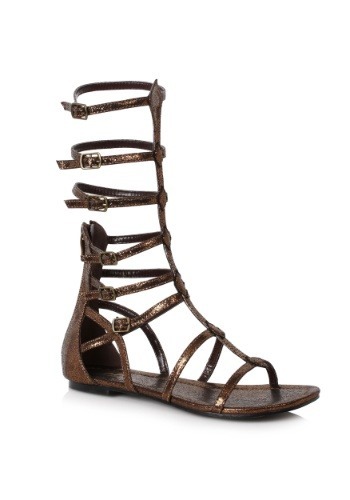 Whether you're dressing up as a well to do empress or a dangerous gladiator, this classic ancient sandal is key. You'll look right at home in your armor as these dramatic sandals reach mid-leg when you buckle into these shoes. With a solid backing, your feet will feel solid as you show off your best battle stance at your next costume party. So, put on that tall helmet and secure your fancy toga, now that you've covered the fine details of your footwear, someone should really immortalize your look by painting you on an ancient urn or something. Maybe you'll catch an artist's eye by posting a couple awesome warrior photos on Instagram. Is #mosiacthis a hashtag yet? Rock these sandals and you might just start a web-wide trend!